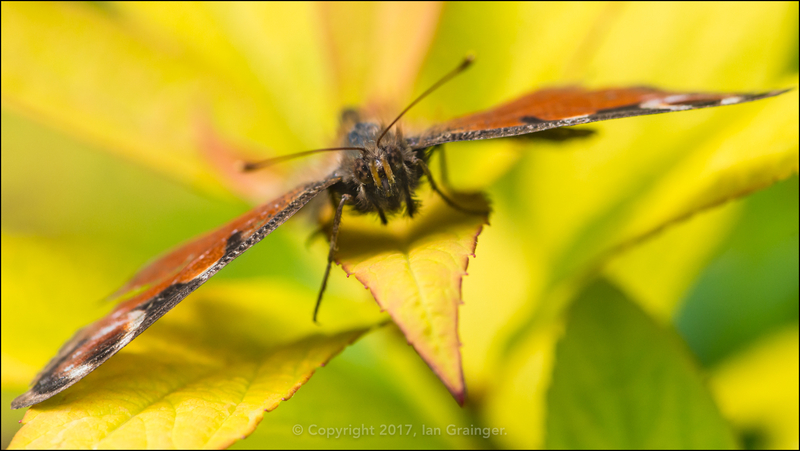 We had beautiful warm and sunny weather for my Sunday morning photo shoot this week, and this meant that there was lots of insect activity. 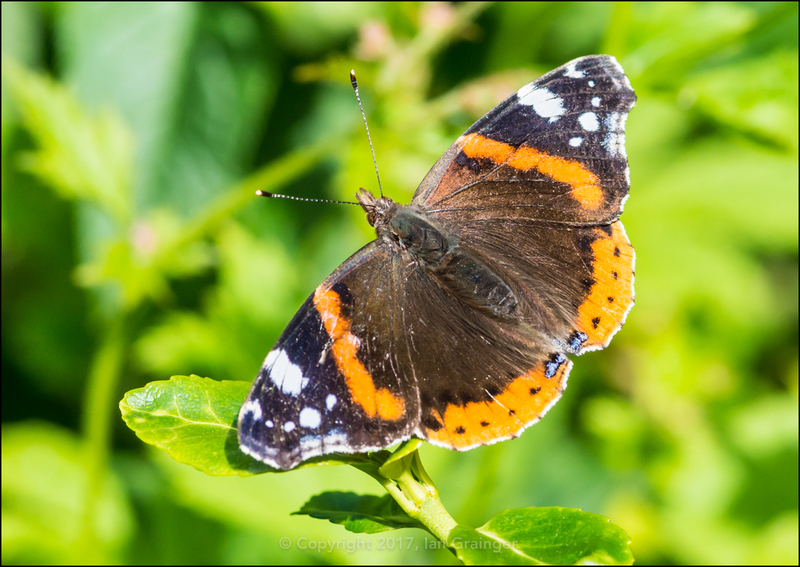 In particular, the Butterflies (Lepidoptera) were out in force, with this meeting with a Peacock Butterfly (Aglais io) resulting in my favourite shot this week. 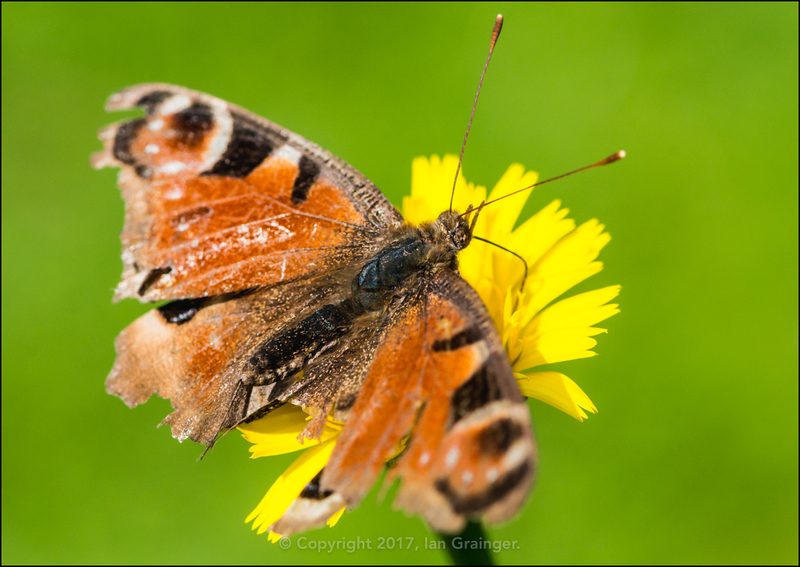 This particular Peacock was looking a bit ragged and faded, but he still seemed to be enjoying zooming around dad's garden collecting pollen from here, there and everywhere! 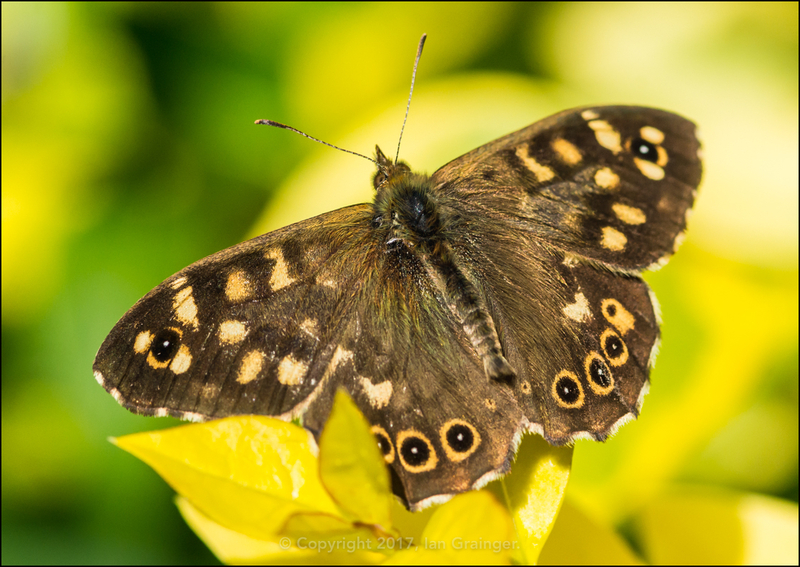 ...as was this Speckled Wood Butterfly (Pararge aegeria). 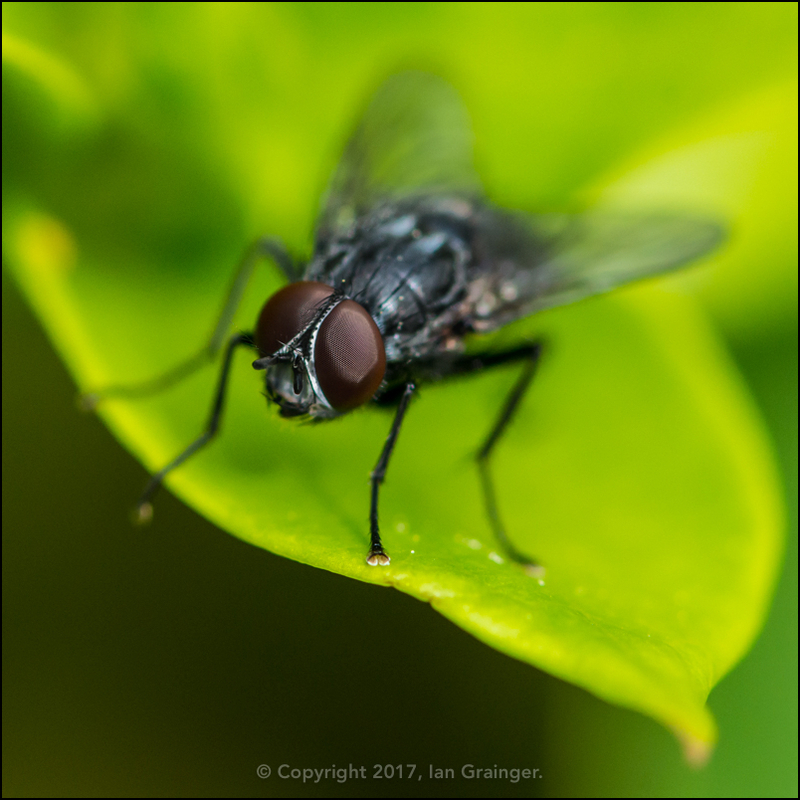 There were plenty of Flies (Diptera), although most of them were resting in sunny spots, readying themselves for a day of buzzing around. 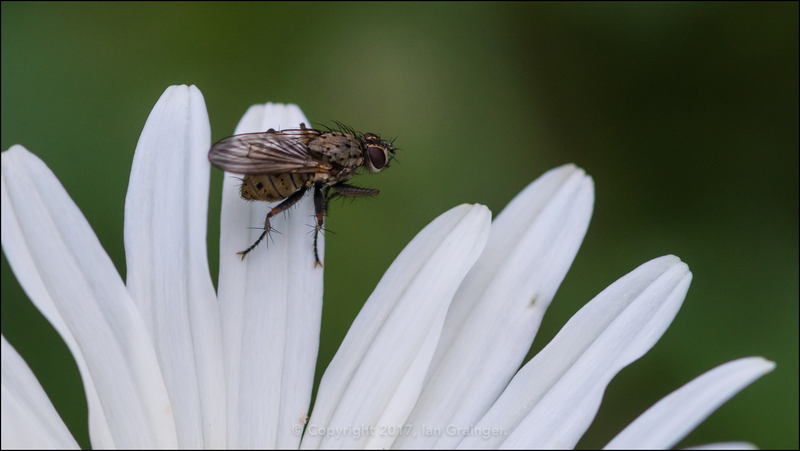 While most Flies chose leaves, this hairy chap seemed content to sun himself on the petals of an Oxeye Daisy (Leucanthemum vulgare). 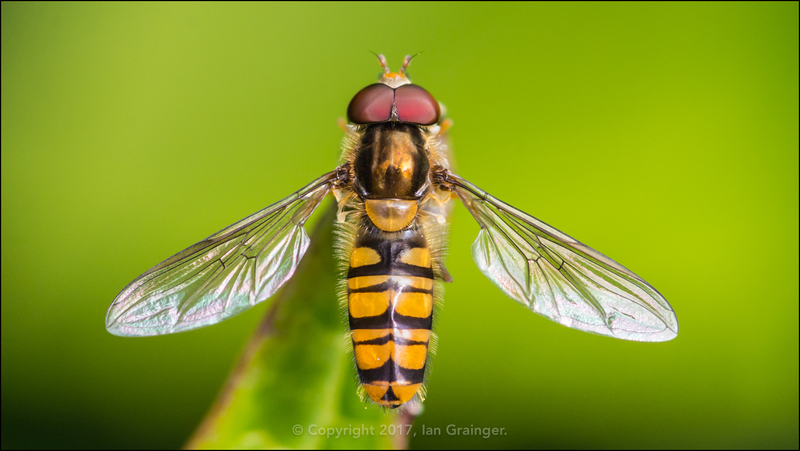 I was pleased to see that there were an abundance of Hoverflies (Syrphidae) back after the winter break. 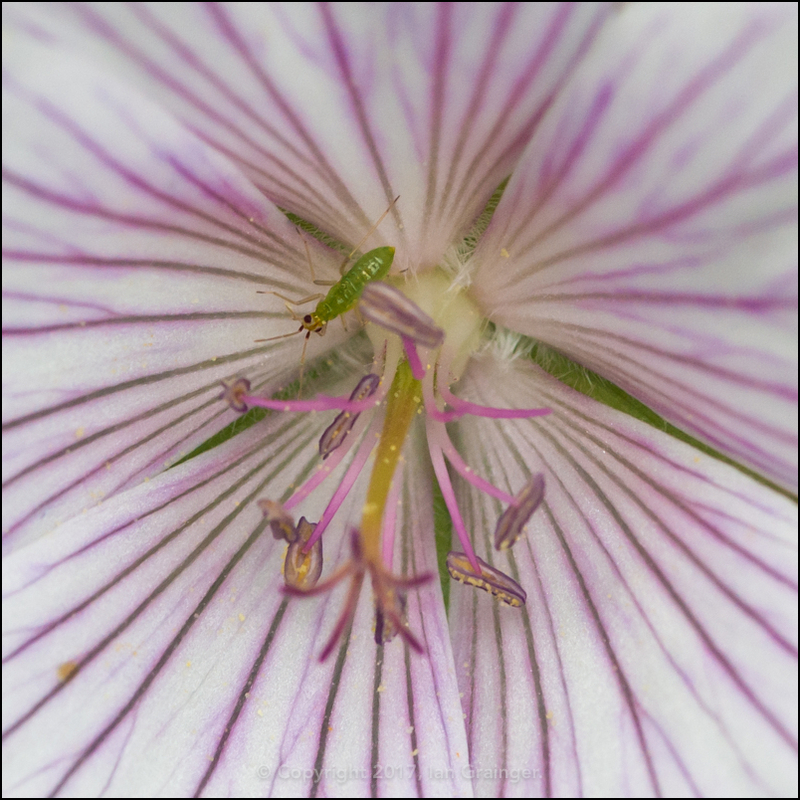 I hadn't seen so many recently, but it seems they were waiting for the right time to return. 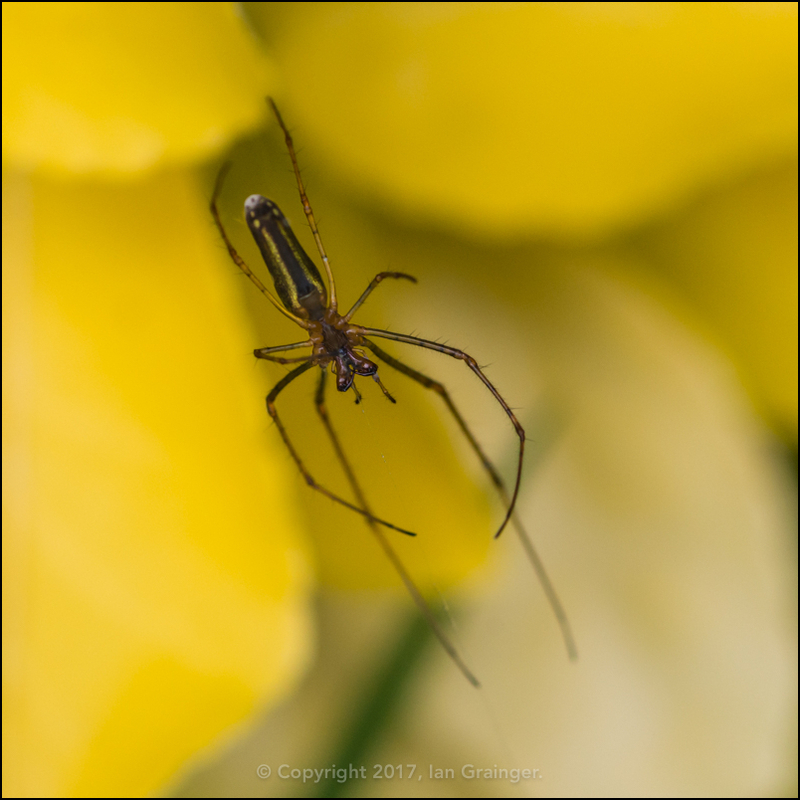 I hadn't seen one of these Stretch Spiders (Tetragnatha) in quite a while either, and was glad to come across one hiding in the tall grasses behind the greenhouse. 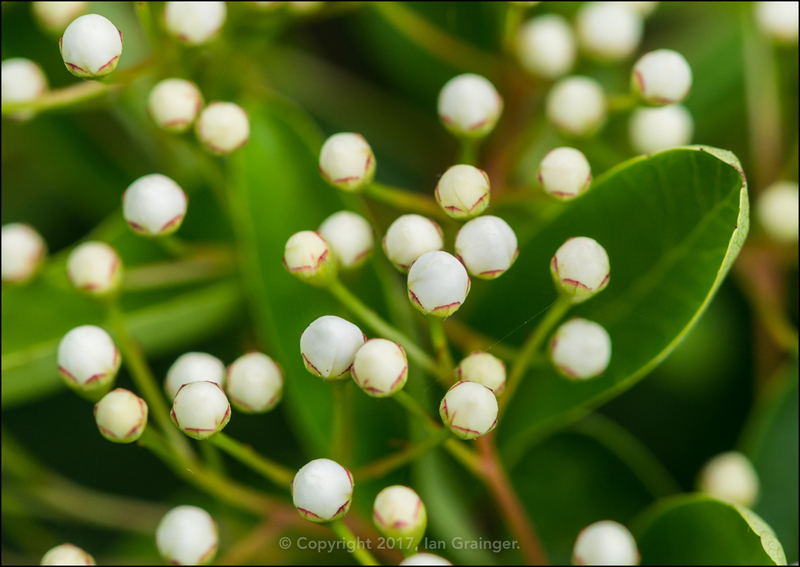 When I was a kid, we used to call this Cuckoo Spit, because it coincided with hearing the first call of the Cuckoo (Cuculus canorus). 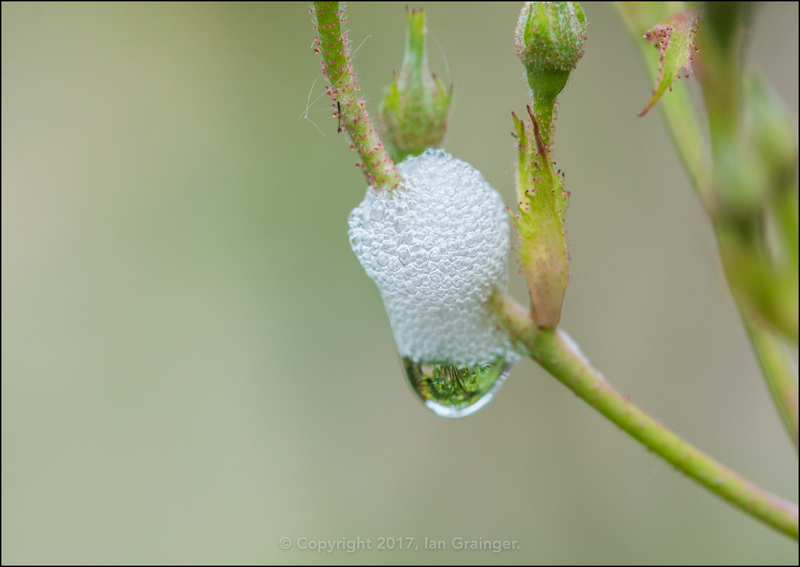 However, it has nothing to do with Cuckoo's, and is actually what a Froghopper (Cercopoidea) nymph uses to protect itself from predators. 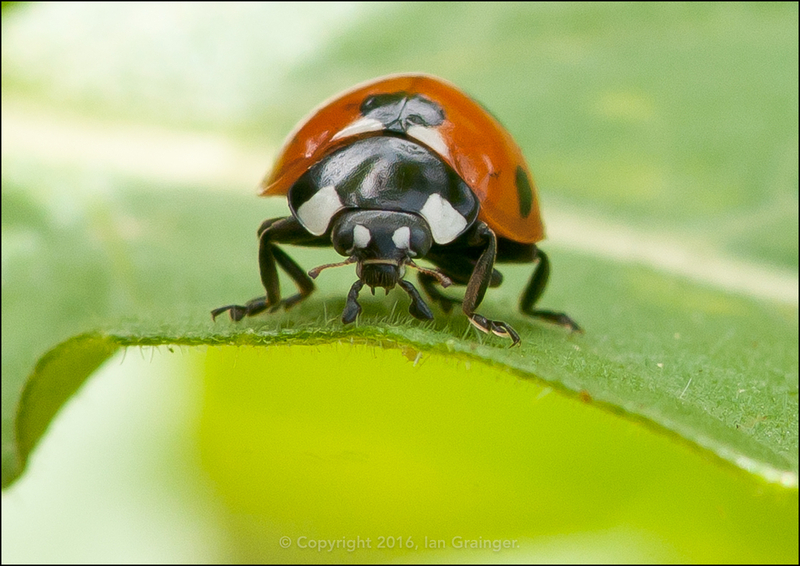 Talking of predators, I wish there were a few more Ladybirds (Coccinellidae) to rid both mine and my dad's garden of these little Greenfly (Aphid) menaces. 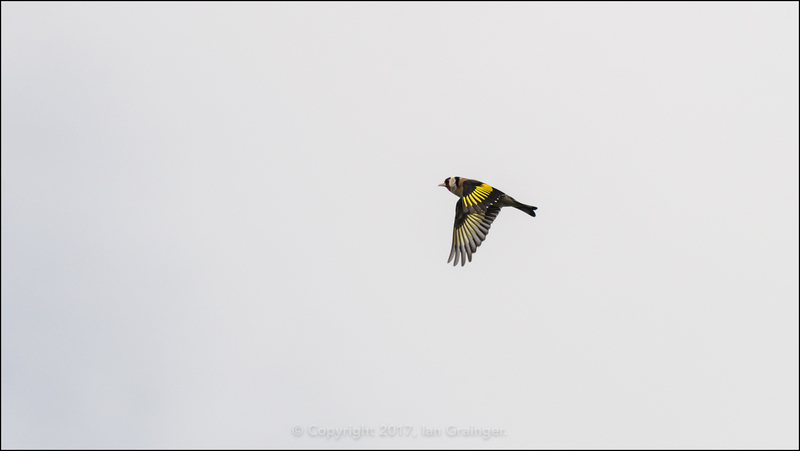 Despite it being a mostly bright and beautiful day, when it clouded over for a while, there was still something colourful to shoot, with a family of Goldfinch (Carduelis carduelis) regularly passing across my lens. 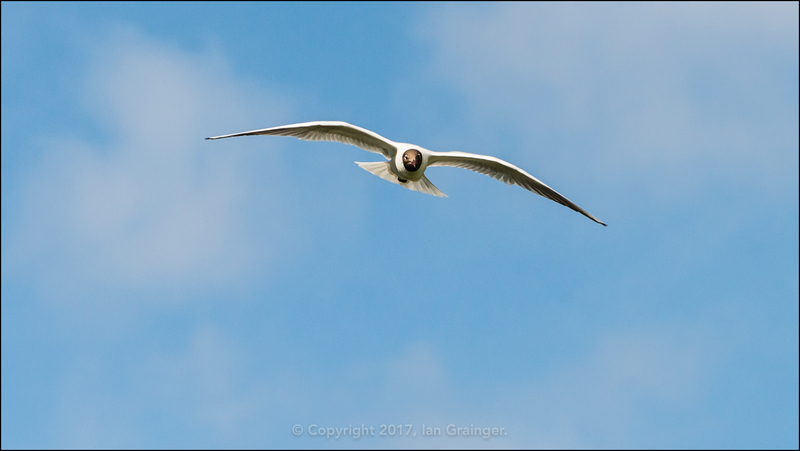 When the blue skies returned, ironically, there was something black and white to photograph, with a flock of Black Headed Gulls (Chroicocephalus ridibundus) hunting down scraps from neighbouring gardens. 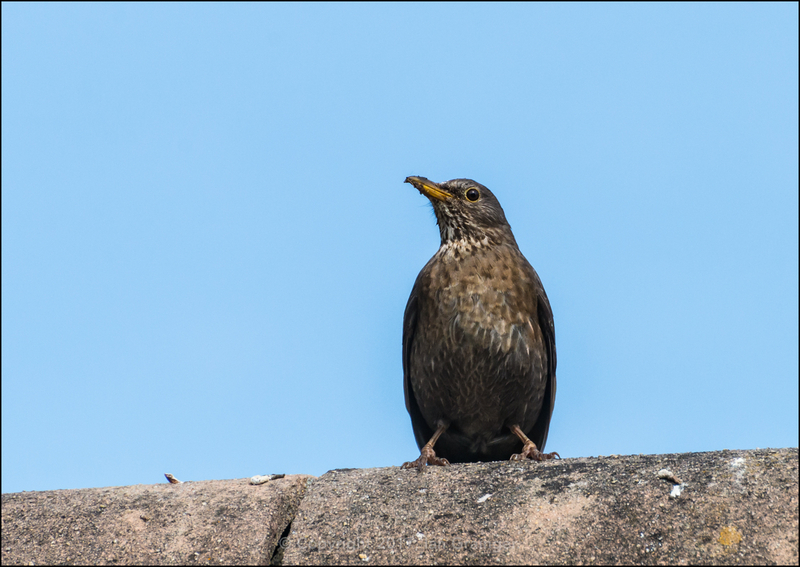 This Blackbird (Turdus merula) was on high alert, and was feeding her young who had taken up residence in a Camellia bush next to the garage. 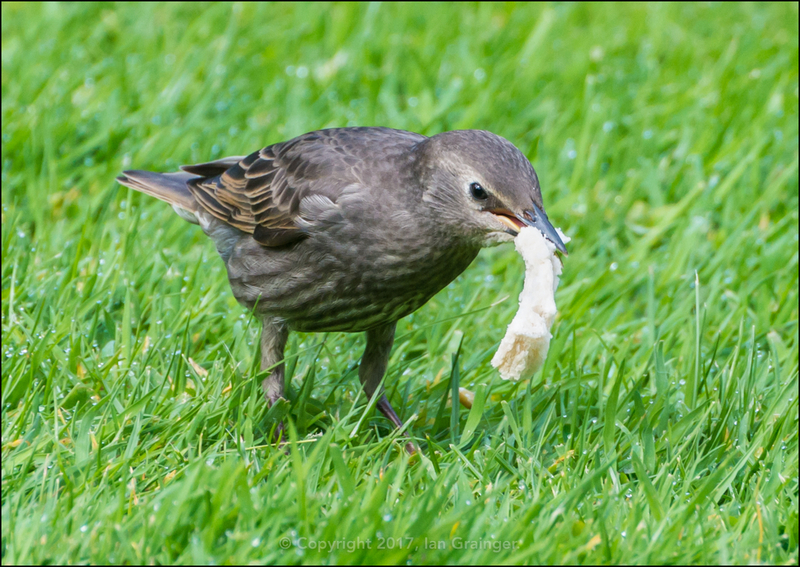 While this juvenile Starling (Sturnus vulgaris) was quite comical to watch as it wrestled with a piece of bread that it obviously thought was a worm. 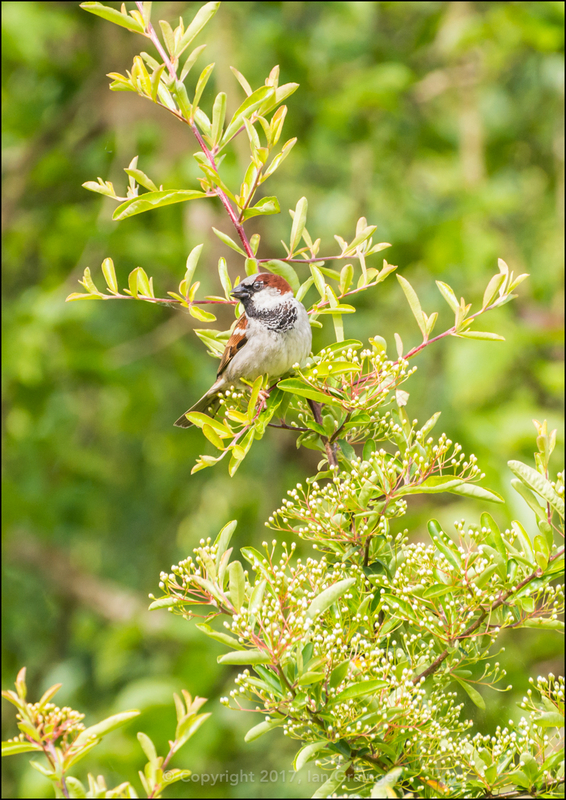 This House Sparrow (Passer domesticus) looked on from the Firethorn (Pyracantha) bush, waiting for the coast to be clear before swooping down to the lawn to collect some crumbs. 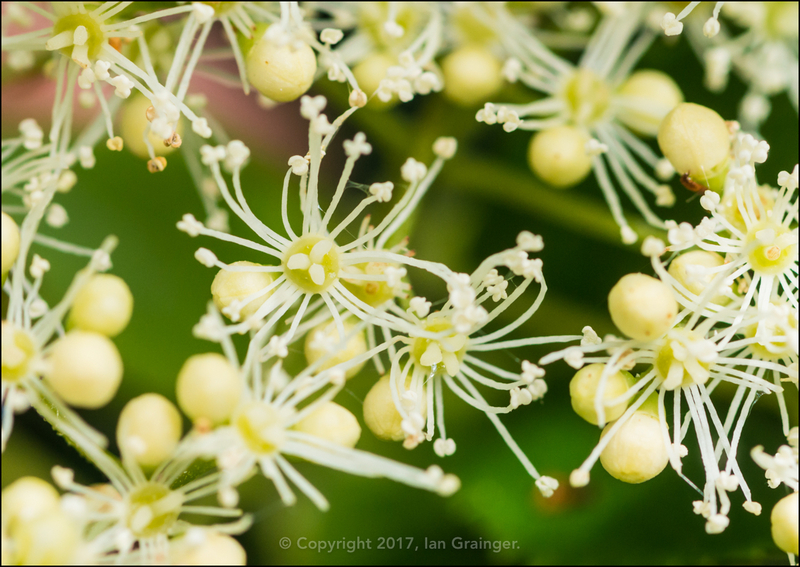 New blooms to dad's garden this week included this Climbing Hydrangea (Hydrangea anomala) blossom, which was attracting quite a few insect admirers. 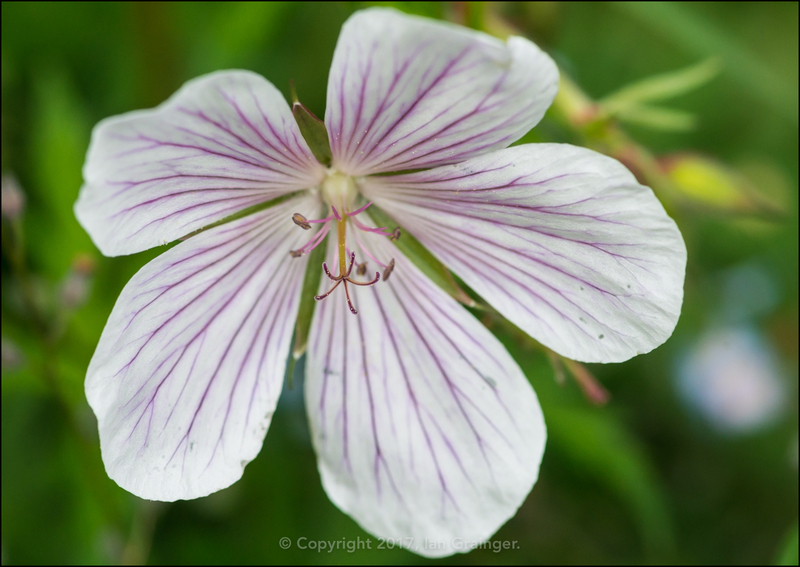 We've already seen a Greenfly enjoying one of these pretty Geranium blooms, but luckily, not all of them had a green coloured passenger. 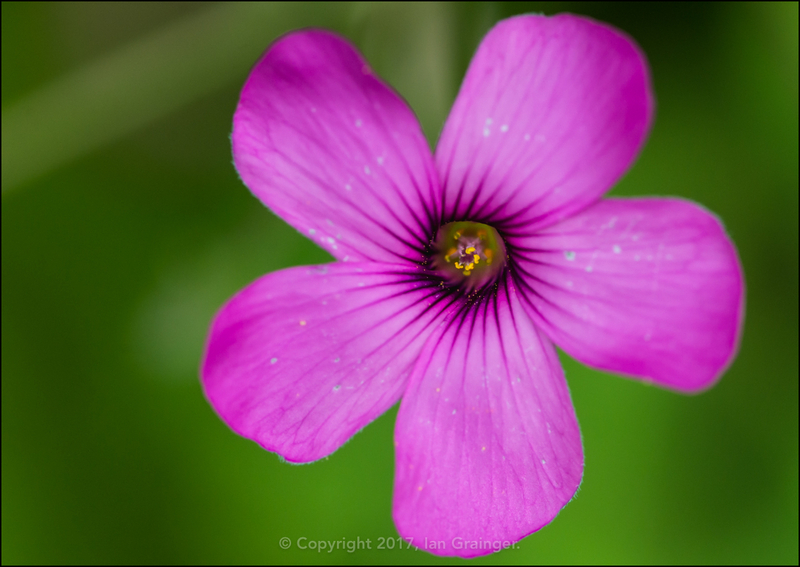 The Oxalis had also begun to come into flower, and was looking particularly beautiful. 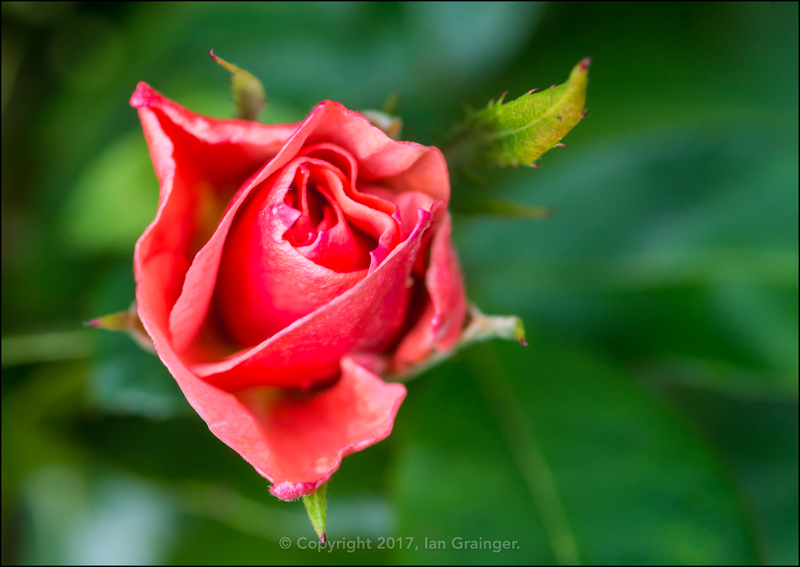 Finally in dad's garden, his Queen Elizabeth Rose (Rosa) had once again begun producing flowers. 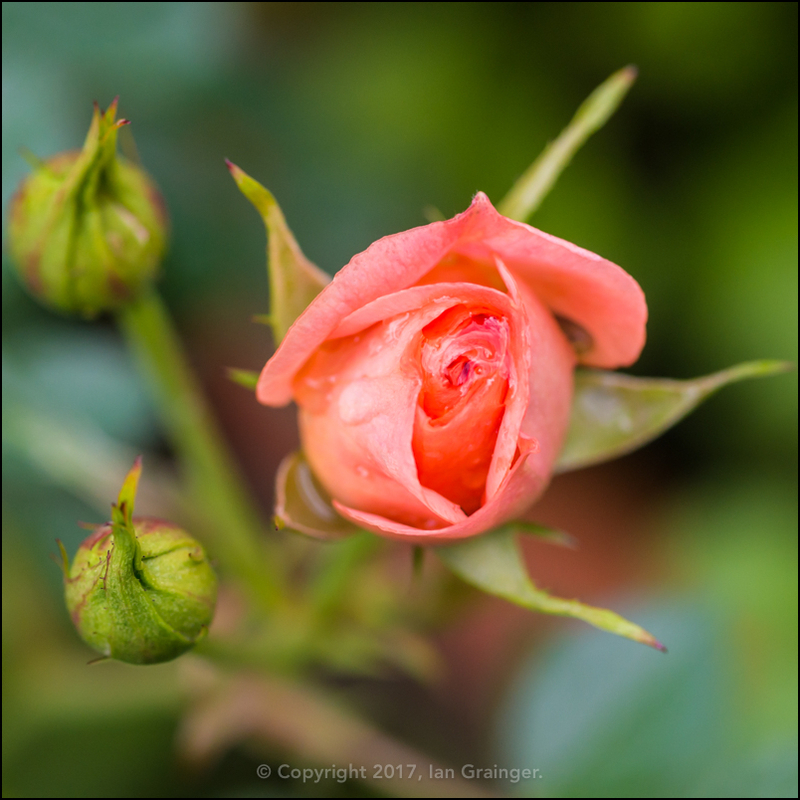 Over in my own garden, I had a Rose of my own on show, and this one is variety 'Sweet Dream', and eventually opens up into a lovely mass of apricot coloured petals. 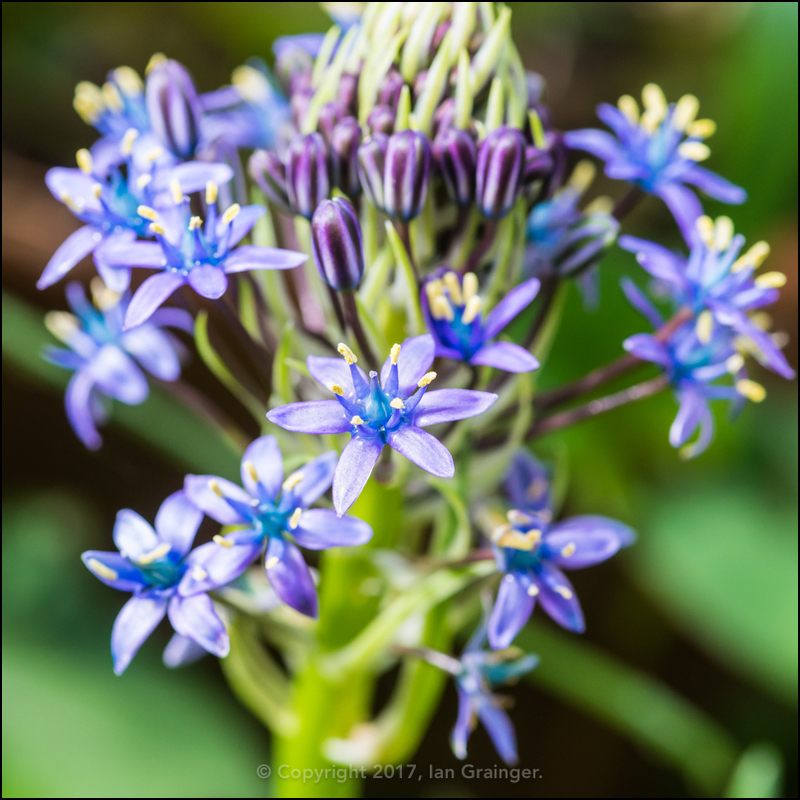 My Portuguese Squill (Scilla peruviana) was almost beginning to show in all her glory, but wasn't quite there yet. 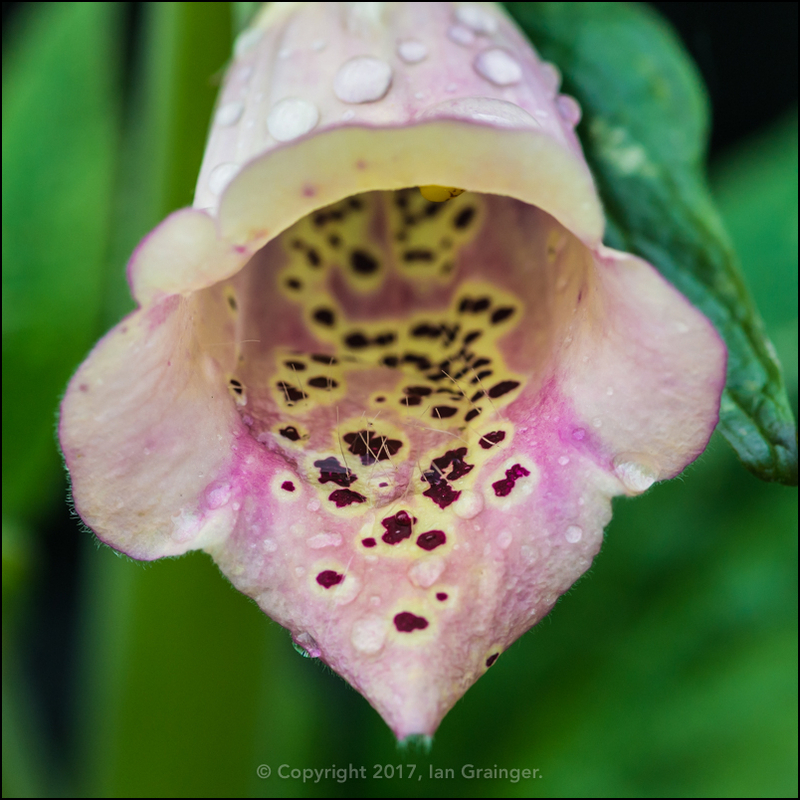 I had a number of Foxgloves (Digitalis) bursting into bloom, with this one being my favourite at the moment. 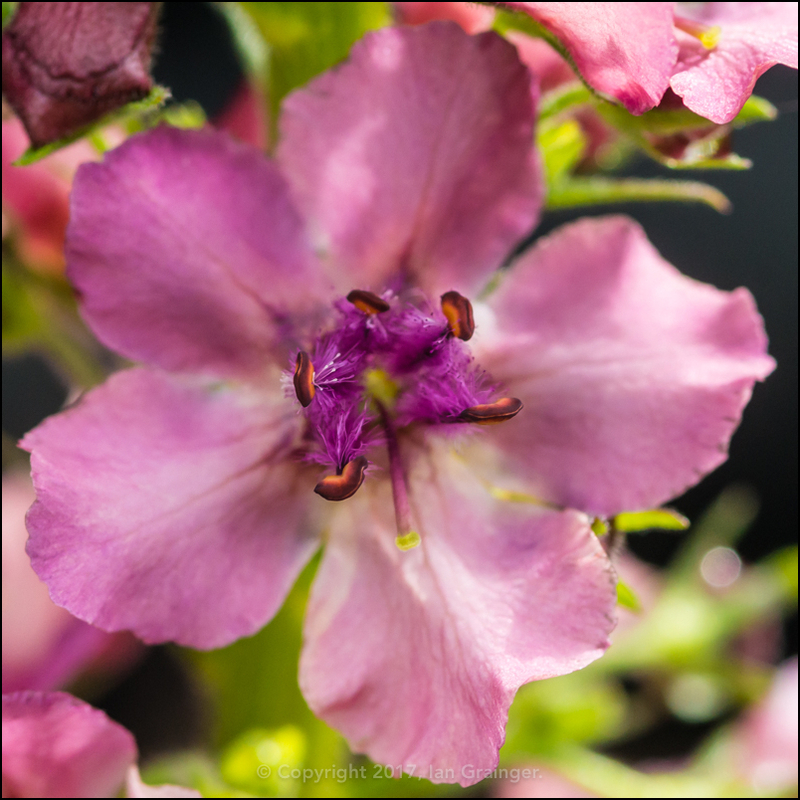 I was pleased to see the return of my Verbascum 'Southern Charm', although it seems to have returned with a slightly darker colour this year. 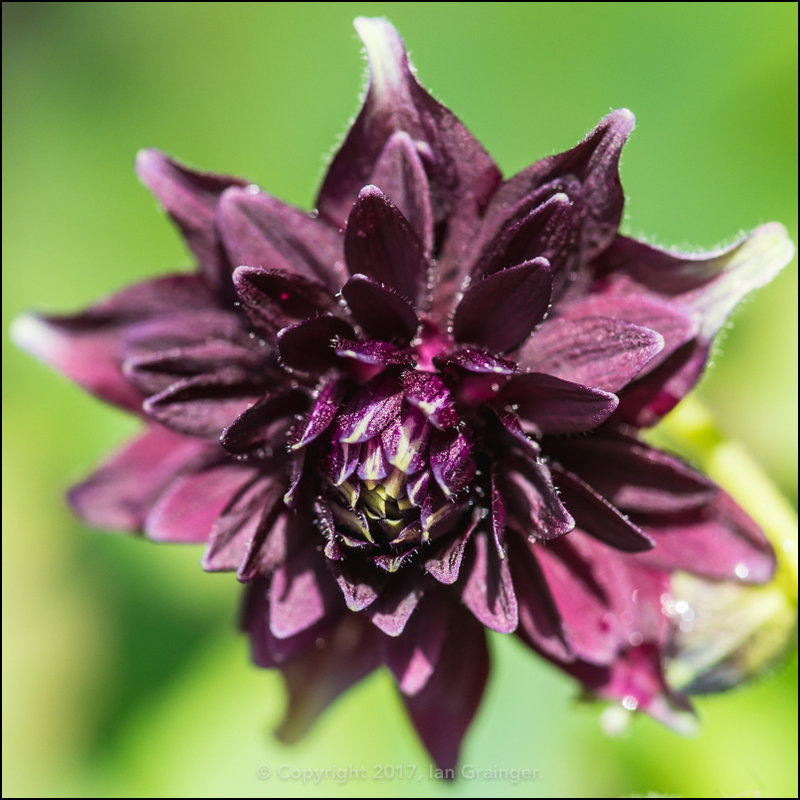 I'm absolutely amazed to see this Granny's Bonnet (Aquilegia) 'Black Barlow' return, as those who have followed my gardening experiences will know, I'm hopeless at keeping these plants alive - while everyone else complains that they grow like weeds! 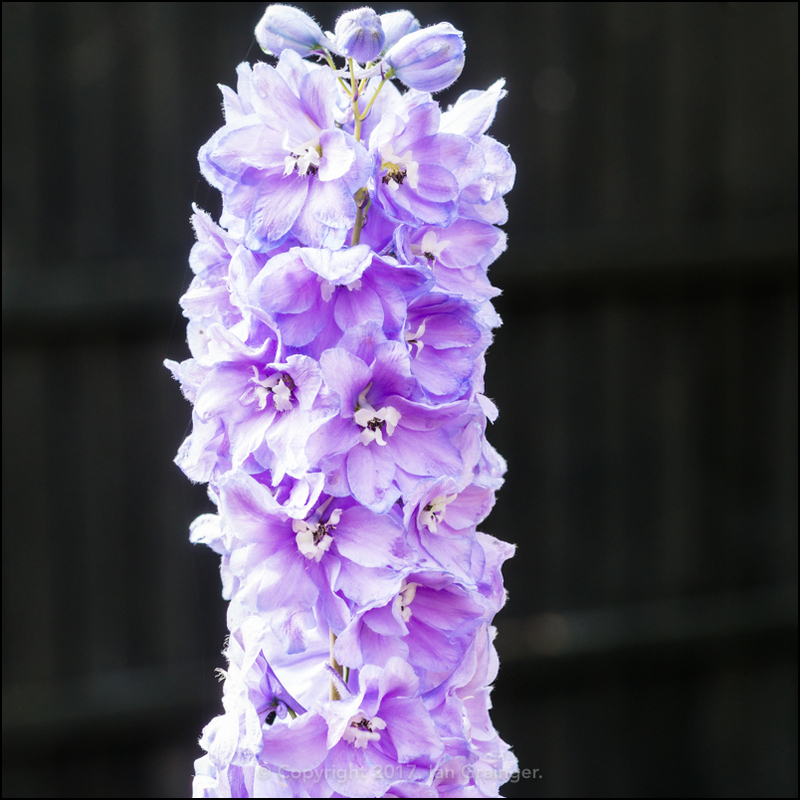 Finally for this week, my Larkspur (Delphinium) plants were putting on a magnificent display, and looked stunning against my black painted fence.